In a land covered by snow you could not expect more of a chance of life for you. Hungry and thirsty, the only thing that came to your mind was a good caribou. You no have forces to hunt and the few that have you must save. But the hunger made you change your mind. You locate a herd just ahead. You creep and focuse on the caribou you want to eat. Run for it, but in an instant you can not stand and fall. Close your eyes and decide to rest. When you wake up, you are no longer in the place that was before. Now it was a warm and comfortable den. Suddenly a piece of caribou meat falls in your front. You look up and see a black and white wolf. He just go back and sits in your front "Eat." he says. Hungry, you do not think twice and grasps the piece of meat. You sleep again. The next day you get up and walk away. When you were halfway, the wolf calls you and you look back, startled, "What are you seeking?" he asks and you say "A new home..." the wolf looks at you with a smile "Maybe what you're looking for, is a few steps back..."
When walking in the grounds of Sakura Tribe you can see snow everywhere. 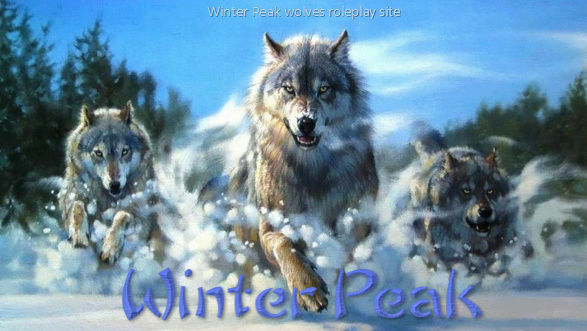 If you walk further north you will find the Winter Peak. There it's where is the center of the territory of Sakura Tribe. it's a place where few wolves risk themselves, because many avalanches happen. When moving to the left side of the peak with about half an hour walk, you will find the hunting grounds. The hunting grounds is where the pack hunt their meal. Many predators are here, so it's a dangerous place. If you walk into the forest behind the hunting grounds with 15 minute walk you will be in the Frozen Forest and if you walk for more 15 minutes you will be near an ocean. There it's also a place for rituals and celebrations of Sakura Tribe. Returning to the hunting grounds,Move yourself to the west and with about 10 minutes walk you will find the Sakura Tribe den. There is the main territory of the Sakura Tribe and it's the place where members spend most of their time. Further north den with about 1 hour walk you will find the Human Village. There is where humans live. In this village are some sheds with stocks of fish, flock of sheeps and ranches with horses. It is an extreme risk place for wolves and other wildlife.